New Customers only. £10 min deposit. The bonus will be applied once the full deposit amount has been wagered at least once with cumulative odds of 1.5 or greater. Wagering must be cleared within 60 days. This offer may not be combined with any other offer. Deposit balance is available for withdrawal at any time. General deposit method & withdrawal restrictions apply & full T&C\'s apply. Cash stakes only. Min £10 stake required for initial £5 free bet. Min odds ½. Max £25 in free bets. Subsequent free bets equal 50% average of each 3 qualifying bets. 13 bets required to receive full £25 free bet. Qualifying bet must be placed within 30 days of opening account. Full bet expires after 7 days. Payment method restrictions apply. 18+, UK & NI only. Promo code ‘SPORTS60’. 1st sports bet of £10+ in one transaction, settled in 60 days. Odds evens (2.0) +. £30 free bet paid within 48 hours of bet settlement, 7-day expiry. Offer not available on 06/04/2019. Payment restrictions apply. SMS validation may be required. Game restrictions apply. Max 30 Free Spins on selected games. 7 day expiry. Full T&Cs apply. New UK & NI Customers. 18+. Stake from £5 to £25 on any Sportsbook market for the first time, at odds of evens (2.0) or greater and get a matched Free Bet within 24 hours of settlement, 7-day expiry. Stake £10 on any Totepool bet for the first time and receive £10 back in cash within 24 hours of settlement. T&Cs Apply. When you place a Trixie bet, you are placing four bets on three different selections. A £1 win-only Trixie bet would, therefore, cost £4. How much you win from a Trixie depends on the number of selections which win and the odds of each one. Because a Trixie bet contains no single bets, two of the selections must win in order for a return to be achieved on the bet. The four bets consist of three doubles and a treble. The diagram below shows a win-only Trixie. Bets one, two and three consists of the doubles, and the fourth bet is the treble. Work out your winnings with our Trixie Bet Calculator. Why Make a Trixie Bet? If you place an accumulator, you require every single selection to come in to win the bet. With a Trixie, it is a little different as you can still get a return on your bet even if one selection doesn’t come in. 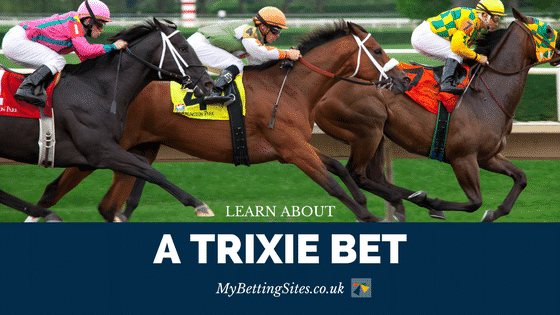 Therefore one key advantage of the Trixie bet is that it provides a better chance of return, and can be considered to be like insurance on an accumulator. The disadvantage of a Trixie bet is that it does require a higher stake. The tradeoff of increased probability of winning is that the returns are likely to be lower. Is It Possible to Do an Each Way Trixie? An each way Trixie bet consists of eight bets. Four of the bets are to win, as above in the image. Four extra bets in an each way bet are for the selections to place. 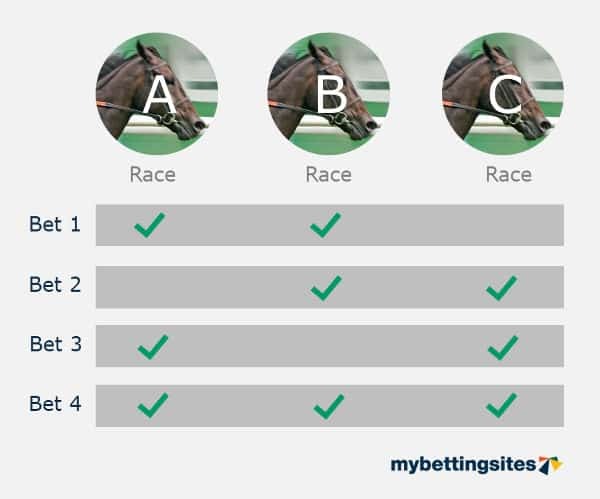 We have another article which explains how each way bets work in more detail. What Is the Difference Between a Trixie and a Patent Bet? Patent bets also feature three selections, but there is one key difference. A Trixie has four bets. A Patent bet has seven bets. A Patent includes all of the four bets in the image above but features an additional three bets. These three additional bets are three singles, one for each of the selections. The stake of a patent would be larger, but a return would be made if just one selection come in. The return would be unlikely to be greater than the stake though. A Trixie bet consists of four bets over three different selections. It has three doubles and a treble. It is a popular way to bet because it has an increased chance of a return being achieved versus a multiple comprising of singles.